Cheers to a peachy weekend! Culottes: Thumbs up or down? How to: wavy beach hair all summer long! Electric Blue Mascara: thumbs up or down? Go-to summer straw hats under $35! Ok, let’s talk summer hair! I bet I’m not the only girl in here who has a dream haircut. Am I right? Unfortunately, for some (or gazillion) reasons those sassy little dos tend to stay in lust-land for way too long. My dream-do is the saucy and somewhat messy short bob with a brave blunt fringe. 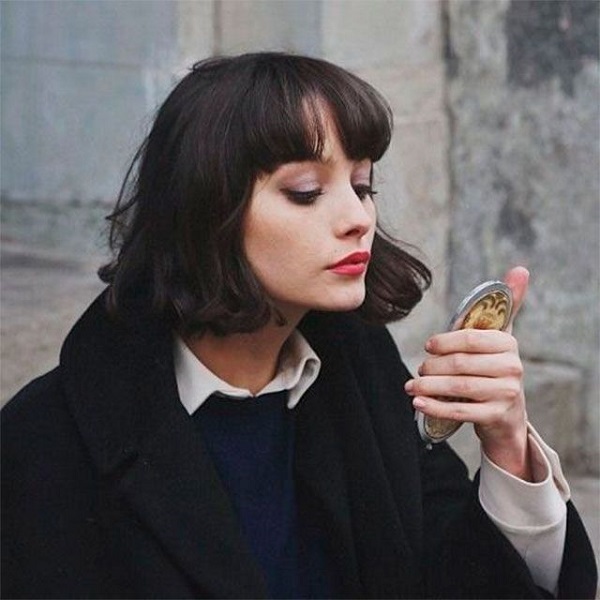 The thing that makes it irresistible is its mix of Audrey Tatou in "Amelia" with a dash of 1920s classical coolness. Even Tim Rogers said this hairdo is a statement of self-assurance and French perfection - le sigh! What do you say? Tell me about your dream haircut! P.S: Fancy more hair tickle? Fun, I always wanted a very short pixie but I'm afraid my head will look too little. Go for it. I went from very long hair to a lob and I am loving it! I say go for it. I did the bob with blunt fringe and while I chose to ease in with bob first because a blunt fringe can be maintenance, i definitely recommend it. I totally should go for it, Anonymous:) Ah! Love these haircuts and this time period style.